There was a time when people were having to put up with traditional white as the sole color of choice if they wanted to take advantage of the special assets and qualities of vinyl windows for their home. Now you can have the best of every advantage there is to installing vinyl windows and find them in plenty of colors other than white. There are enough colors to match existing themes if that’s your aim. 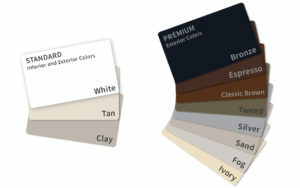 Color choices for vinyl windows now come with products from our top manufacturers, like Milgard, Andersen and Ply Gem. Of course, there are always other different window options that we sell as well. Milgard produces vinyl windows in 8 premium exterior colors (see image) in addition to their most traditional color themes of white, tan and clay. 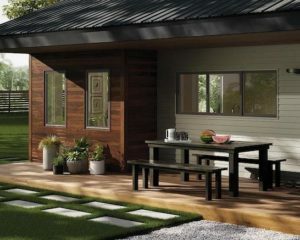 Take for example their Trinsic Series, with this series you will be able to find a desirable color to suit almost any outdoor color scheme you have. The colors are created so as to produce a neutral visual effect in all color value ranges. You get energy efficiency, maintenance free durability, and a great variety of colors, all backed by the solid industry name of Milgard. Their products fully backed with a lifetime warranty. Contact us to learn more about painted vinyl windows by Milgard. Andersen vinyl windows mean quality and innovation. And now you can add color varieties to suit your designing needs for your home. Andersen provides vinyl windows of virtually any shape and size and you will find them in a good range of colors as well. Andersen products have set many industry standards over the years and their products come with their exclusive Owner-to-Owner® limited warranty. That’s a lot of peace of mind! More information on Andersen products and the manufacturers specifications and history can be found on the Andersen website. Another of our wonderful product suppliers! Ply Gem Vinyl windows come in popular standard colors that will work into your exterior color scheme of choice.They feature grill and hardware options worthy of any design endeavor. Energy efficiency choices are there to fulfill your low energy consumption needs in accordance with your special geographical location requirements. Want the look of steel or aluminum windows without breaking the bank? Install beautiful silver colored vinyl windows for a sleek and modern look at an affordable cost! Our in house specialists can help you through every step of selecting and ordering the perfect painted vinyl window to fulfill your individual needs.